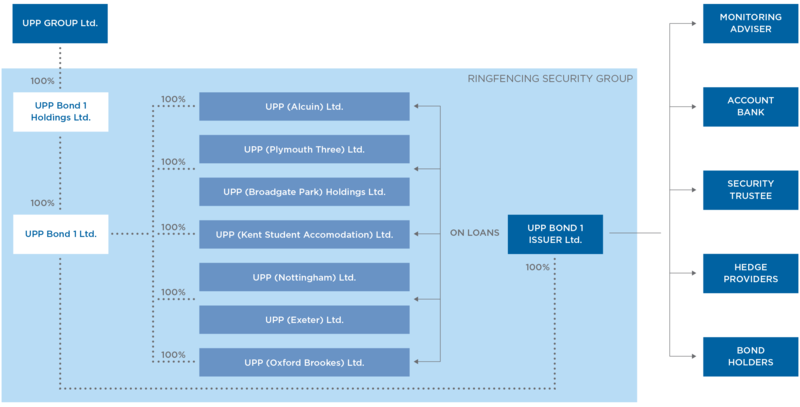 UPP Bond 1 Issuer plc (the “Issuer”) has been incorporated as a special purpose company for the purpose of issuing the Notes under the Programme. The net proceeds of Initial Notes issued under the Programme will be used by the Issuer to (i) advance On-Loans to the AssetCos, and (ii) pay transaction costs associated with the Programme. Each AssetCo will use the proceeds of the Initial Notes advanced to it to refinance outstanding financial indebtedness and associated hedging liabilities. In connection with Notes issued after the Initial Notes, the proceeds of Notes issued under the Programme will be used to advance On-Loans to (i) existing AssetCos in respect of New Assets, or (ii) to an Acceding AssetCo in respect of New Assets. The net proceeds of Notes issued under the Programme will also be used to fund the amounts required to be held in the Debt Service Reserve Account. Notes issued under the Programme will indirectly benefit from security The payment of interest and repayment of principal by each AssetCos in respect of the On-Loan will provide the primary source of funds for the Issuer to make payments of interest and repayments (or prepayments) of principal under the Notes.